Technical, Tech, Tec or Tek Diving- What is it? Technical Diving- what is it and who cares? Before we start, it might be useful to explore about what is meant by technical diving. (Often contracted to tec, tech or tek). Technical diving as a term has its roots in the early 90's publication Aquacorps where it seems to have been first used to describe diving beyond the usual realm of recreational scuba. Technical diving remains loosely defined and there is no accepted definition but rather a group of definitions with some common themes- a little like art “I can’t define it but I know it when I see it”. So goes technical diving. This last definition encompasses, I believe, the essence and broadness of technical diving in general and the the DSAT technical diving programme in particular. Palmer’s definition probably excludes a decompression dive to 165’ on a single cylinder (BSAC recreational training, for example) yet very much includes the DSAT Tec 40 dives which use twinsets or sidemount or single/ pony configuration, involving up to 2 gases with decompression for dives of a depth of 130’. 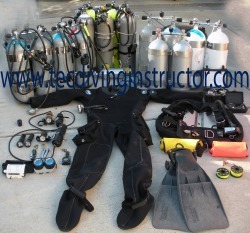 Technical diving requires specialised training, equipment and certification. Such training is offered by a small group of select, individual instructors (such as Paul) and some scuba instruction schools. The selection of both your instructor and the agency itself should not be taken lightly and I strongly urge you to cross examine me, or any other instructor, before taking the proverbial plunge. Cost should not be the determining factor in your choice- if it is the PRIMARY criterion for you, do not contact me. You may very well regret choosing a cheap instructor (hopefully living to regreat it), this is serious stuff and things are cheap for a reason- think about that. Because of the depths and complexities involved, technical diving is generally considered to be a higher risk activity than recreational scuba diving. Technical diving requires a significant commitment to its practice plus an understanding of the risks involved.